Without installing any screen recording software, you can capture your Gnome desktop instantly in Ubuntu 18.04 with a built-in tool. No app launcher, no command line option, and no quick option to start or stop it. Gnome’s built-in screen recorder only offers a keyboard shortcut to start and stop recording the full-screen of your Gnome desktop. 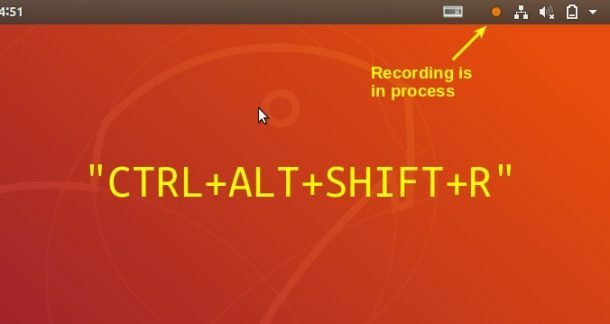 Ctrl+Alt+Shift+R to start or stop recording. A red circle in the top right corner indicates that the recording is in progress. Recording automatically stops after 30 seconds (time can be changed). Only record the full-screen of your desktop. Automatically saved in user’s Videos folder in the WebM format. There are two things you can do to the screen recorder: Maximum time of screen recording, and keyboard shortcut. SimpleScreenRecorder (both available in Ubuntu Software), or Green Recorder. How to enable sound recording as well?